Balao Class Submarine: Laid down, 28 January 1943, at the Electric Boat Company, Groton, CT.; Launched, 17 October 1943; Commissioned USS Shark (SS-314), 14 February 1944; Sunk on 3rd patrol by depth charge off Southern Taiwan, 24 October 1944, all hands lost; Struck from the Naval Register, (date unknown). 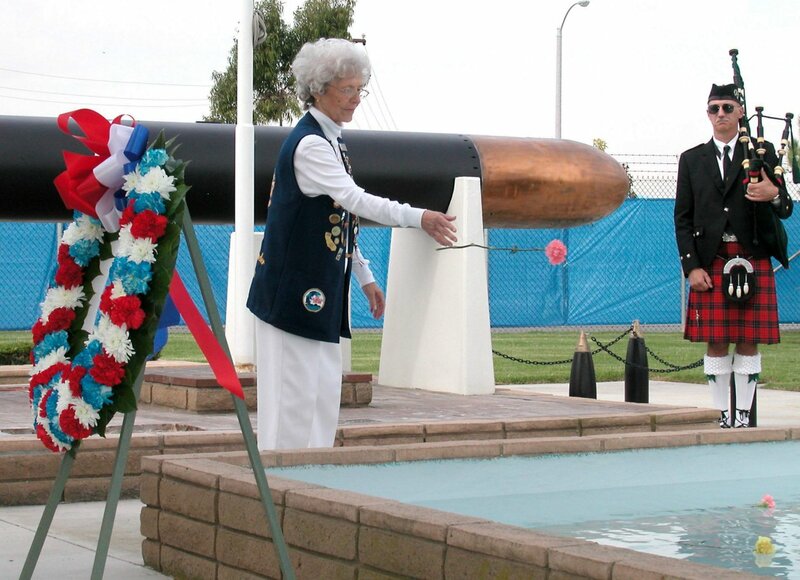 Shark received one battle star for her World War II service. 484k One small step for man, one giant leap for mankind. 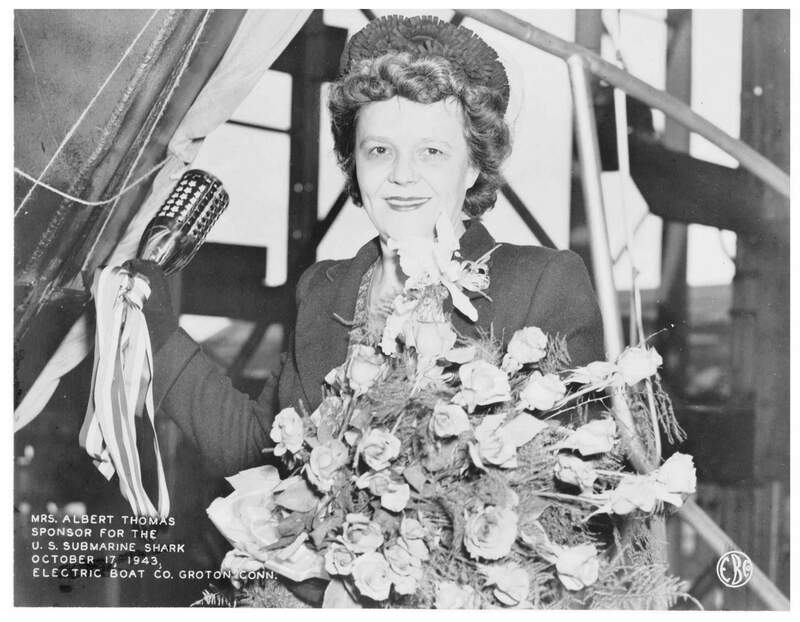 Shark (SS-314) was sponsored on 17 October 1943 by Mrs. Albert Thomas, wife of Honorable Albert Thomas, United States Congressman from the Eighth District of Texas; he was a Democratic Congressman from Houston, Texas for 29 years and was responsible for bringing the Johnson Space Center to Houston. 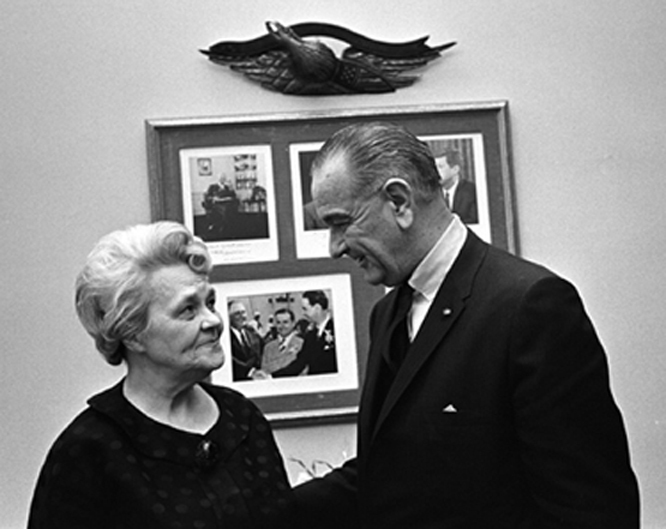 Lera Millard Thomas is pictured here with President Lyndon Baines Johnson, 34 years after her christening of the Shark when she succeeded her husband as the Representative in Congress representing the Eighth District of Texas from 1966 to 1967. Partial text courtesy of DANFS, history.house.gov, & en.wikipedia.org. Image courtesy of the Lyndon Baines Johnson Presidential Library, National Archives and Records Administration. 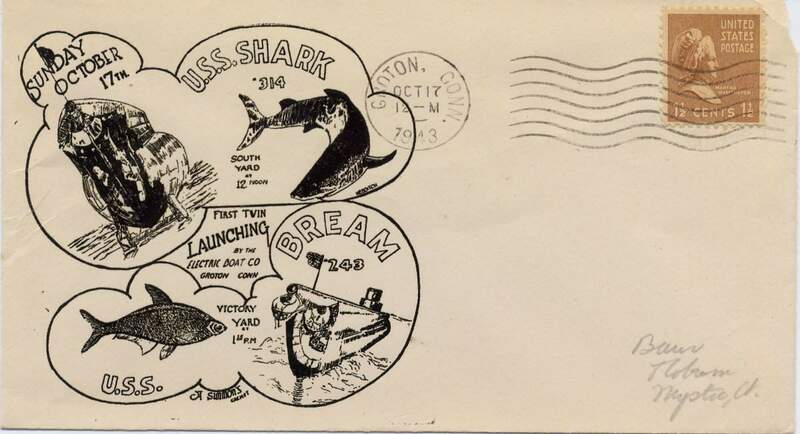 Photo courtesy of Wendy S. Gulley, Archivist, Submarine Force Museum, Naval Submarine Base NLON, Groton, CT.
90k Postal cover marking the launching of the Shark (SS-314) from the South Yard of Electric Boat Company and the launching of the Bream (SS-243) at Electric Boat's Victory Yard on 17 October 1943. Courtesy of Darryl L. Baker. 177k Shark (SS-314) slides down the ways at the Electric Boat Co., Groton, CT., 17 October 1943. Taken by an Electric Boat Company photographer. Official USN photo # 80-G-88704, now in the collections of the National Archives. 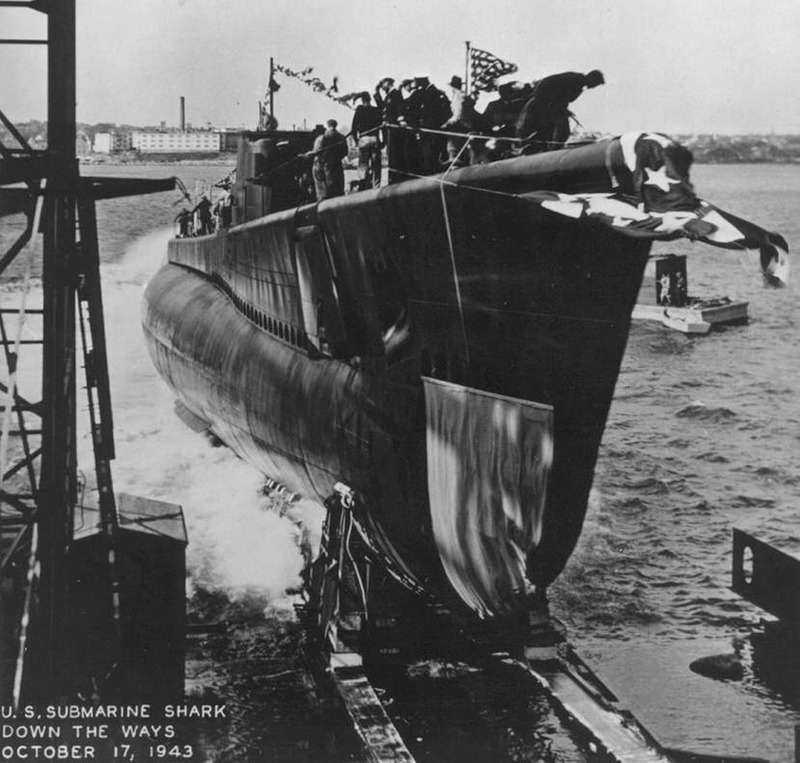 774k The launching of the Shark (SS-174) from the South Yard of Electric Boat Company. 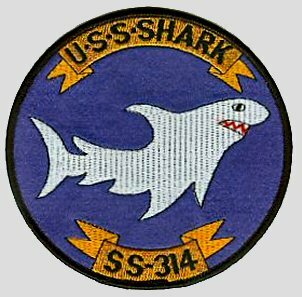 Five page PDF file showing the history of USN vessels named Shark. USN photo courtesy of Scott Koen & ussnewyork.com. 94k Cdr. 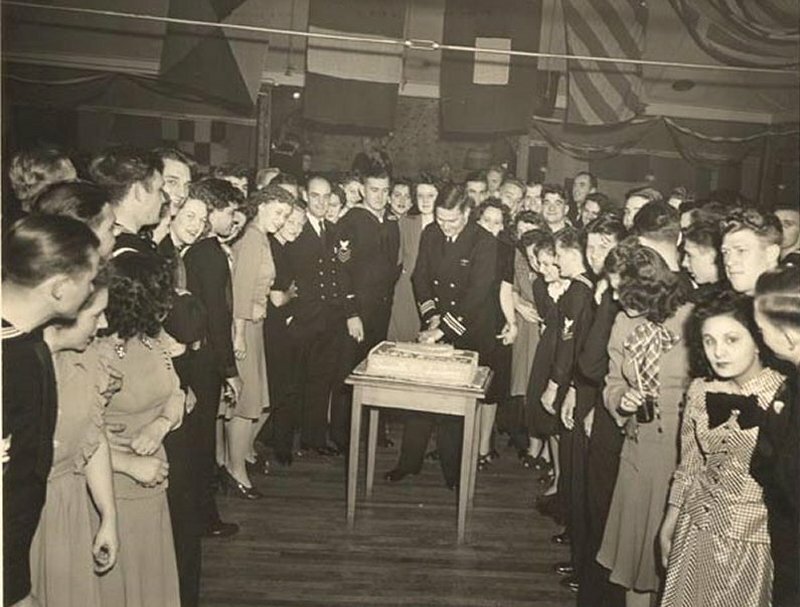 Blakely cuts the cake at Shark's (SS-314) commissioning party, February 1944 at Polly's Inn off West Norwich Road, Montville, CT. Courtesy of 99main.com. 98k Wives and crew members of the Shark (SS-314). Cdr. 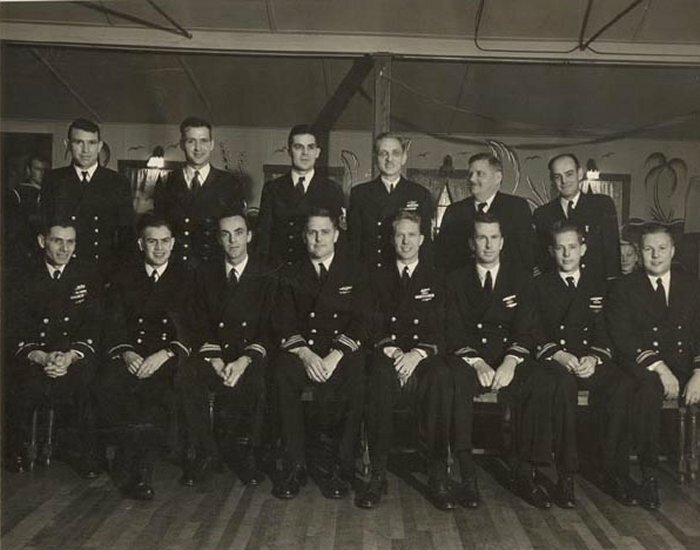 Blakely is second on the left, first row, February 1944 at Polly's Inn off West Norwich Road, Montville, CT. Courtesy of 99main.com. 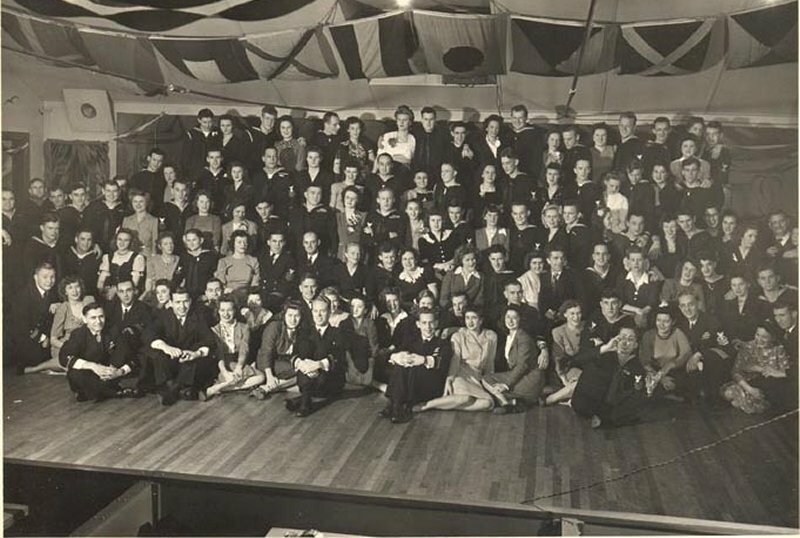 90k Officers and crew members of the Shark (SS-314) at the commissioning party, February 1944 at Polly's Inn off West Norwich Road, Montville, CT. Courtesy of 99main.com. 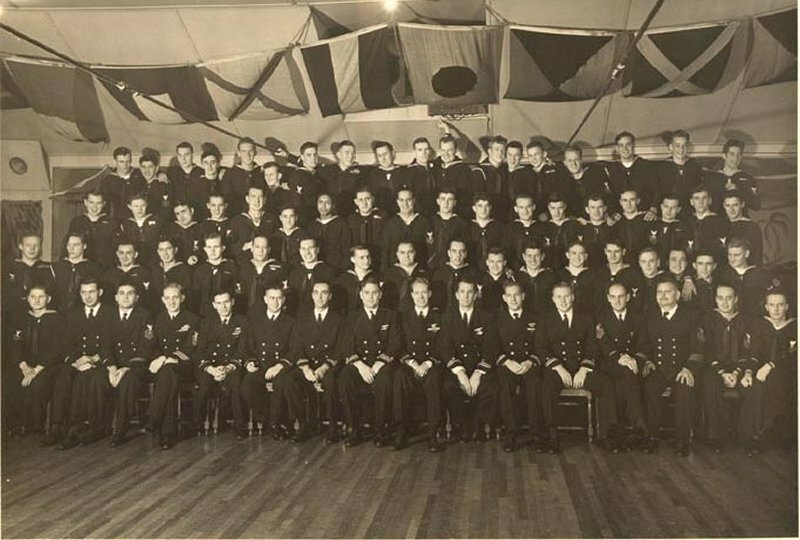 60k Officers of the Shark (SS-314) at the commissioning party, February 1944 at Polly's Inn off West Norwich Road, Montville, CT. Courtesy of 99main.com. 152k On 5 June 1944 at 1645, Blakely torpedoes and sinks Takaoka Maru carrying about 3,500 reinforcments to the defenders of Saipan, at 18-40N, 140-35E. 25 crewmen and 115 soldiers are KIA. Immediately afterwards, Blakely torpedoes and sinks Tamahime Maru in the same position, 52 crewmen are KIA. Text courtesy of combinedfleet.com. Image courtesy of Australian war memorial wikimedia.org. 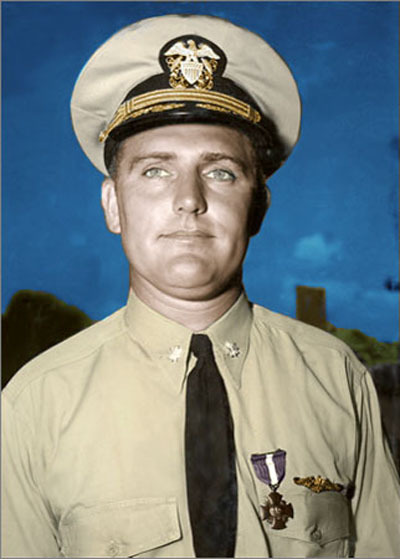 123k Edward Noe Blakely, Commander (Commanding Officer) of the Shark (SS-314) at the time of her loss. USN photo courtesy of oneternalpatrol.com. 245k After making radar contact, the Shark (SS-314) was in pursuit of a single freighter. 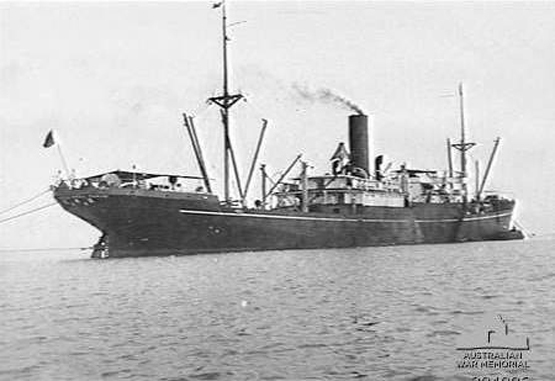 Approximately 5:00 pm 24 October 1944 in the Bashi Straits, South China Sea Latitude 20�46'N, Longitude 118�18' E, the 6886 ton Japanese freighter Arisan Maru was sunk. 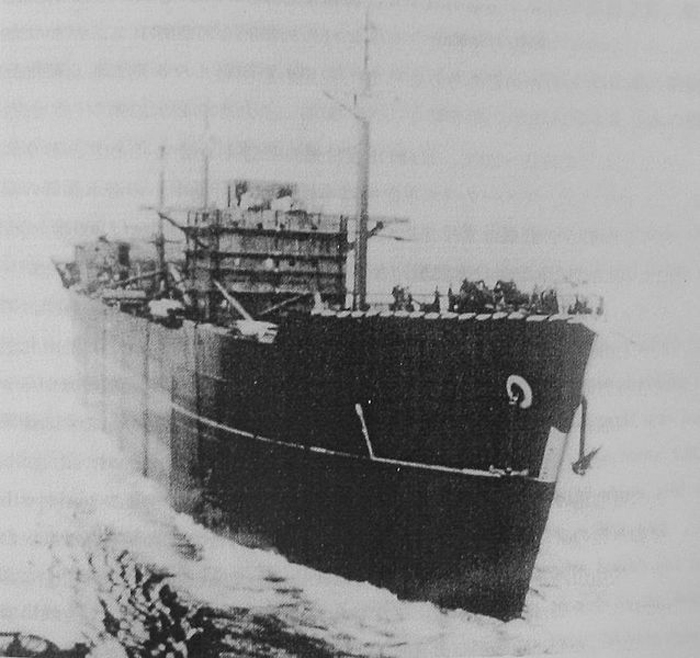 The Arisan Maru carried no markings or flag to indicate that it was carrying Allied prisoners (1800 to be exact). The Americans had no way of recognizing the Arisan Maru was a prison ship. The torpedo launched from the Shark, hit aft of midships causing the Arisan Maru to split in two. Naval records indicate that the Shark, was lost with all 87 hands in the same battle after having torpedoed the Arisan Maru. "Regardless of the final count (approximatley 1792 US servicemen), the sinking of the Arisan Maru still represents the greatest loss of American life in a single military sinking." � excerpt: The Arisan Maru Tragedy. Text courtesy of en.wikipedia.org. 123k General area map of Bashi Channel, where the Shark (SS-314) was sunk in waters over several thousand feet. 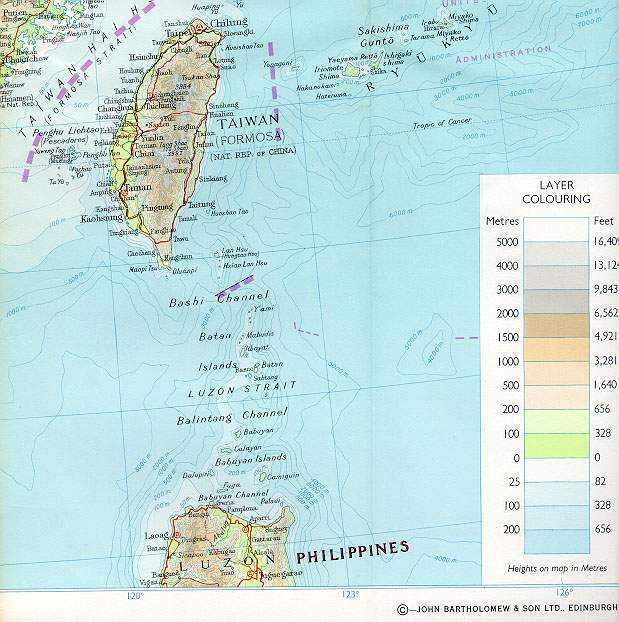 "Map of Southeast Asia," by Bartholemew & Son Ltd, Edinburgh, courtesy of taipeipeacepeople.com. 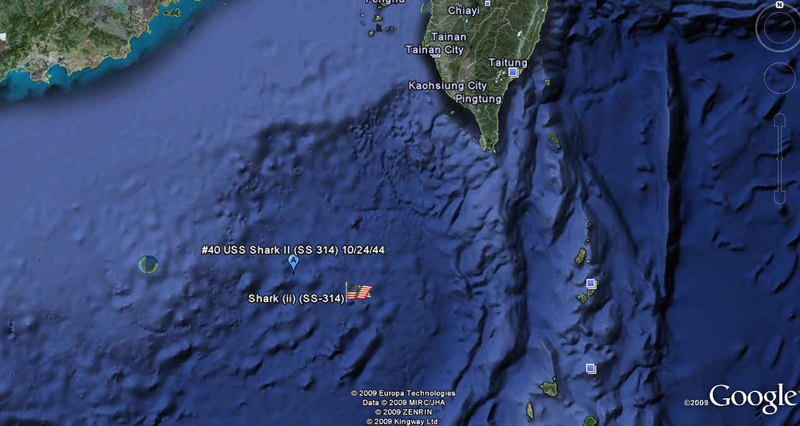 259k Google Earth satellite photo where Shark (SS-314) is assumed to have been lost. View courtesy of Google Earth. 32k Japanese destroyer Harukaze, credited with sinking the Shark (SS-314), according to Submarines Lost Through Enemy Action Photo courtesy of Aryeh Wetterhorn via spruso.com. 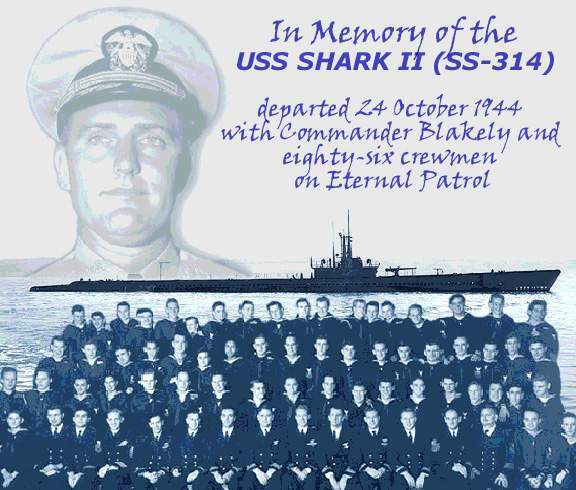 50k Commemorative photo in honor of the memory of the crew of the Shark (SS-314). Photo courtesy of Tom Kermen. Dante's Prayer courtesy of Loreena McKennitt via quinlanroad.com. 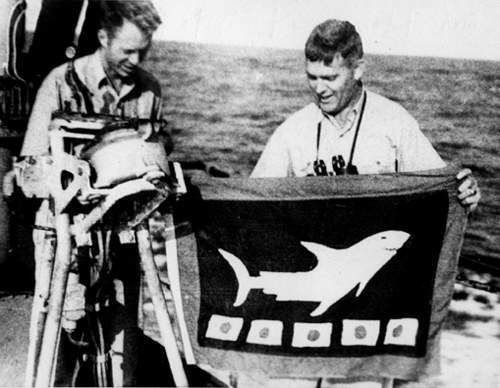 30k Shark (SS-314) crewmen holding up ship's pennant. "When the waves of death compassed me / the floods of ungodly men made me afraid; / the bonds of She'ol encircled me; / the snares of death took me by surprise; / in my distress I called upon the Lord, / and cried to my G-D: / and he heard my voice out of his temple, / and my cry entered into his ears. / Then the earth shook and trembled; /the foundations of heaven moved / and shook because of his anger /...the heavy mass of waters, and thick clouds of the skies /... And the channels of the sea appeared, / the foundations of the world were laid bare, / at the rebuking of the Lord, at the blast at the breath of his nostrils. / He sent from above, he took me; / he drew me out of many waters; / he delivered me from my strong enemy, and from those who hated me; for they were too strong for me. / They surprised me in the day of my calamity: / but the Lord was my stay / He brought me forth also into a large place: / he delivered me because he delighted in me./" Courtesy of csp.navy.mil .